The Dutchman insists he can play attractive football despite suggestions to the contrary. 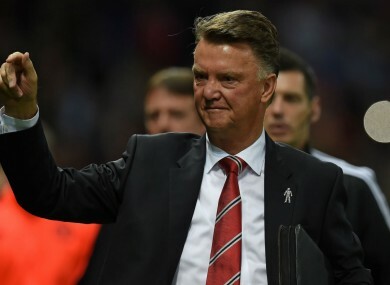 Manchester United coach Louis van Gaal has played down claims that he is not an attacking coach. LOUIS VAN GAAL has responded to Paul Scholes’ comments that his tactics at Manchester United are too negative by referencing his success with attacking football at Ajax. Former United midfielder Scholes has been critical of the approach adopted by the Dutchman at Old Trafford, suggesting he “has a problem with creative players”. But Van Gaal does not feel that is the case, referencing the Ajax side he coached to three Eredivisie titles and the Champions League trophy between 1991 and 1997. The 64-year-old also claimed he financed the signing of Finidi George out of his own pocket and brought through many inventive players at the Dutch side. “We didn’t have any money and we were bankrupt, so I had to look to youth,” Van Gaal told The Telegraph. “We scouted [Jari] Litmanen, a Finnish player, who we bought for £10,000. We also bought Finidi George. He was a Nigerian international. He was £3,000. I paid it by myself! And then, we bought Marc Overmars. “But the names that you do remember are [Clarence] Seedorf, [Patrick] Kluivert and [Michael] Reiziger. Van Gaal also spoke about the Netherlands’ failure to qualify for Euro 2016, insisting that the team has lost chemistry rather than identity. “The Dutch have not qualified, so now [people are saying] the Dutch school is ‘nothing’ any more — rubbish. Email “'Mr Scholes will be very angry' - Van Gaal talks up his attacking pedigree”. Feedback on “'Mr Scholes will be very angry' - Van Gaal talks up his attacking pedigree”.